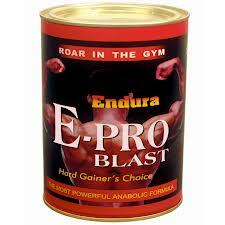 Endura E-Pro Blast is one of the finest supplements available in the market today. Specifically formulated for serious body builders, it attains the highest level of solubility possible and still maintains the enhanced functional ability of protein. With a balanced combination of whey, soy & casein, it contains the best possible amino-acid profile specifically useful for body builders. For energy and proper metabolic function of the body it also contains complex Carbohydrates, Minerals and Vitamins. With a combination of numerous premium ingredients and exercise programme, a person can enhance muscle mass and muscular performance. Unbelievable price on ENDURA E- PRO BLAST in Mumbai (India) company Euphoria Healthcare Pvt. Ltd..